Mods, if this post is against any rules (if those have been determined yet), I apologize, and go ahead and delete my post. I can't vote as I'm not on facebook (sorry). But thanks for letting us know about the contest, and the models! Quote: WATERLOO REGION — Uptown Waterloo and the Borden Avenue area in Kitchener are expected to see the first shovels in the ground for Waterloo Region's light rail transit system. Final designs are in the works now. "We anticipate that the first construction will probably be along Caroline Street and Borden area, but the exact start times aren't finalized," said Thomas Schmidt, commissioner of transportation and environmental services. Schmidt said work will begin before year's end. Construction of the system is expected to be complete in 2017 and that means a few years of road disruptions for residents and businesses. The region is creating a website to detail the first six months of construction plans to give residents a bit of a heads up. It will be updated throughout construction. A less detailed, long-term plan may also be provided. "While we target that and we have that level of detail, you can't guarantee that something is going to happen Sept. 15 two years from now. But we can guarantee what's going to happen for the next six months and give general overviews of what we expect over the whole construction period," Schmidt said. Waterloo Coun. Scott Witmer likes the website idea, but said that won't be enough. "I think the website is a good start, but what happens on the ground can sometimes be a bit different," Witmer said. "We'll need to make sure there's good signage and things like that." Though the plan is to start on Caroline Street in uptown Waterloo, Witmer said he expects traffic impacts will be felt throughout the city. "Our plan to ease the impact during construction — the net needs to be thrown quite broadly," he said. He expects impacts will stretch to Westmount Road and Weber Street. "When you think of the layout of uptown and its connections into the Kitchener core and then back out toward the other end of the city, there aren't too many roads that connect you," Witmer said. "There's limited options already so I think when you start reducing traffic flow … I think we need to be prepared to expect the impact." What might help ease some traffic issues is the anticipated completion of the Weber Street widening to four lanes. The target date for completion is Nov. 13, but Schmidt said the lanes will all likely be open before that. He anticipates a mid-August opening for the Victoria Street and Weber Street intersection and mid-September opening for the new four-lane street. "It should be pretty close to normal," he said. "There will still be work going on." A layer of base asphalt should be in place and project work off the roadway won't yet be finished. Right now utilities along the corridor are being relocated ahead of the rail transit system that will travel 19 kilometres from Conestoga Mall in Waterloo to Fairview Park mall in Kitchener. Construction is also expected to start soon on the express bus route from Fairview Park mall to the Ainslie Street transit terminal in Cambridge. A $5.7-million contract was awarded to a construction company in June to complete the needed road work for the bus route. It includes six stops on Hespeler Road, queue jumps so the buses don't get trapped in traffic, and work at the transit terminal. Schmidt said that system is expected to be up and running next spring. The region hired construction consortium GrandLinq to design, build, finance, operate and maintain the light rail system. It will cost almost $2 billion over 30 years for light rail, including about $818 million to build it. Quote: WATERLOO REGION — And now the work begins. Street sections in Kitchener and Waterloo will be torn up or closed simultaneously as officials prepare to lay tracks for the light rail system starting in 2015. "Building a light rail system is an enormous undertaking. There will be temporary disruptions and inconveniences," said Marty Harris, vice-president of operations for GrandLinq, construction consortium charged with building the region's LRT. At a media briefing Friday, officials laid out plans for the first four months of light rail construction. Work will take place at seven sites in Kitchener and Waterloo by the end of the year, including construction of an operations and maintenance facility on Dutton Drive. "This is the only way it's going to happen," Coun. Tom Galloway said. "You can't build this a foot at a time." No tracks will be laid this year, with mostly preparatory work being done including infrastructure relocations and clearing of vegetation. In Waterloo, the most disruptive work will be on Caroline Street from Erb Street to Allen Street and Allen from Caroline to King Street South. On about Sept. 8, sections of Caroline will be closed to traffic as water and sewer infrastructure is relocated. Access to local businesses and homes will be maintained, but through traffic will be cut off. The work is scheduled for about four months. In Kitchener, the most disruptive work will be at Borden Avenue from Charles Street East to the CN Railway tracks. That's expected to start Sept. 15. Work and access issues will be similar to that of Caroline. Officials have created a website, www.rideion.ca, hotline and email address for residents to stay informed and raise concerns about construction. Galloway expects this first round of construction will set the tone in the community for the rest of the project. "Getting it right the first time is going to be very important," he said. In an attempt to get it right the first time, Harris said GrandLinq does advance training with its supervisors for each neighbourhood where work will take place. "The boots on the ground people have kind of a planning book," he said. Those books outline expected issues and sensitivities in the neighbourhood. Those briefings also include safety training. The light rail system is expected complete by the end of 2016 with trains running 19 kilometres in 2017 from Conestoga Mall in Waterloo to Fairview Park mall in Kitchener. Construction is expected to get underway soon in Cambridge for express buses that will travel 17 kilometres from Fairview Park mall in Kitchener to the Ainslie Street transit terminal. That work includes installation of bus stops and road work. It's being completed by a separate contractor, not part of the light rail consortium. The rapid transit hotline is 1-844-625-1010 and the email is connect@rideion.ca. Quote: CAMBRIDGE – Construction of the first adapted bus rapid transit (aBRT) stop in Cambridge, at the corner of Hespeler Road and Pinebush/Eagle streets, is set to begin this coming Monday (Aug. 18). This is the first of five aBRT stops to be constructed within the next six months, part of a $5.7 million contract awarded by regional council this past June. Rolling lane closures are expected along Hespeler Road while crews construct receiving lanes and queue jumps – right-turn and bus-only lanes – that allow buses to bypass traffic queues at busy intersections, with the aid of traffic signals. The aBRT will link the Ainslie Street bus terminal with the Fairview Park Mall light rail transit (LRT) terminal in Kitchener. Ultimately, regional officials hope to turn the aBRT route into a LRT route once ridership along the corridor is deemed fitting, but that’s expected to take at least 20 years. Work on LRT stops have already begun at locations in Kitchener and Waterloo. 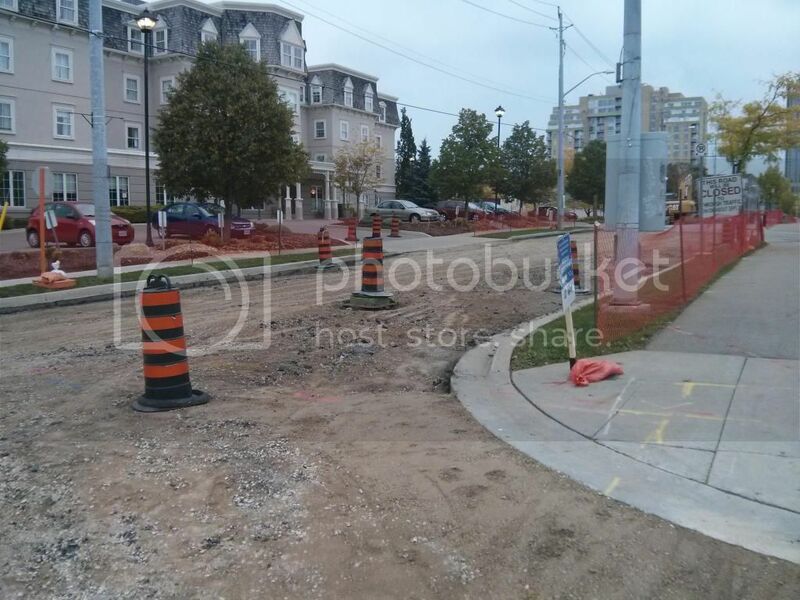 Quote: CAMBRIDGE – Traffic safety drums lined the sidewalk on Hespeler Road near the Pinebush Road/Eagle Street intersection on Monday (Aug. 18) where construction for new adapted bus rapid transit (aBRT) is slated to begin. With people on their way back to school or work following summer holidays, construction for public transit upgrades will be ongoing along Cambridge’s main thoroughfare. “We’re desperately trying to minimize impact,” said the region’s manager of rapid transit co-ordination, Samer Inchasi. According to a news release, construction to accommodate the region’s rapid transit services will be underway at 12 locations during the next six months – five along the Ion aBRT corridor in Cambridge and seven along the Ion light rail transit (LRT) corridor in Kitchener and Waterloo. Regional council awarded the construction contract in June and Ion community relations manager Kimberly Moser explained it took a few weeks to meet with the contractor and confirm the schedule and staging of work. Moser said earlier that rolling lane closures can be expected during the installation of aBRT stops, queue jumps and receiving lanes. Construction in Cambridge will take place during the next few months along Hespeler Road at four intersections – Pinebush Road/Eagle Street, Can-Amera Parkway, the Delta (Coronation Boulevard/Dundas Street) and Munch Avenue – as well as the Ainslie Street terminal. Access to local businesses and residences and the transit terminal are expected to be maintained. “There won’t be any closures of entire roads,” said Inchasi. “It will be lane closure to allow for the work zone at curb locations. According to the news release, Ion staff will continue to meet with stakeholders, including residents, business owners and community groups, to keep them informed of construction and how road restrictions and road closures could impact them. The website http://www.rideION.ca will feature the most up-to-date information. Noise bylaw exemptions are in place to accommodate work during the night time and evening hours, Inchasi noted. All aBRT construction is expected to be completed by the end of the year, with service starting next year. Right-turn and bus-only lanes will allow buses to bypass traffic queues at busy intersections. “The goal with adapted bus rapid transit is to build the ridership and increase the frequency of service that comes through there,” Moser stated in a past interview. Grand River Transit’s iXpress service runs from Fairview Mall in Kitchener to the Ainslie Street terminal, but there are currently few stops in between, she noted. “So this guarantees that we stop at four locations along Hespeler Road, which is high traffic for ridership and where a lot of people are going for destinations, whether it’s shopping or work,” she explained. Quote: WATERLOO — Rarely are politicians so excited about a mountain of dirt. But a mountain of dirt was more than just that Thursday at a ceremonial groundbreaking for Ion, the region's light rail project. Towering over Region of Waterloo politicians at 518 Dutton Dr., with tufts of weeds scattered on it, that pile of dirt represented more than a decade of preparation and politicians' vision for a transportation system to curb urban sprawl and move people. Regional Coun. Jim Wideman said it was symbolic and added that watching the actual construction of light rail will be different than other building projects. "Other than when you go underground, the construction of the LRT is going to be quite innocuous," Wideman said. "It's not something rising up in the sky." The Dutton Drive site will serve as a maintenance and service centre, also providing storage for light rail trains when they're not in operation. A crowd of politicians and local residents were on hand to hear officials marvel at the project. "It is critical public infrastructure that will be a legacy for future generations," said Peter Braid, MP for Kitchener-Waterloo. The federal government is kicking in up to $265 million to build the system and the provincial government up to $300 million. "Our government believes in building Waterloo Region up and that's why we've committed up to $300 million to support the new Ion LRT," said provincial Transportation Minister Steven Del Duca. The region's rapid transit project is expected to cost about $1.9 billion to design, build, finance, operate and maintain over 30 years. About $818 million has been budgeted to build it. The plan was first conceived in the 1970s, but its current incarnation was unveiled by regional planners in 2002 as a way to curb urban sprawl. "That's why we are a successful community," said Regional Chair Ken Seiling. "This region has always looked ahead." Construction is already underway including utility relocations and grading at the maintenance and service centre. Work on city streets that will affect traffic starts this month. Light rail trains are expected to start running on 19 kilometres of track from Conestoga Mall in Waterloo to Fairview Park mall in Kitchener in 2017. Wideman appealed to officials from GrandLinq, the construction consortium awarded the light rail contract, to put the interests of residents first, saying they are the clients. "The single most important thing that you and your staff can do every day is to listen to the people who are impacted along the route," Wideman said. Michael O'Neill, general manager of GrandLinq, said there will be challenges, particularly while city streets are torn up to move underground infrastructure later this year ahead of track being put down in 2015. He committed to working with the community. "Those people whose lives we touch during construction matter to us," O'Neill said. aBRT is on the way!! What's the process for design reviews (public and city) for ION roadway reconstruction. Your best bet is to contact Kim Moser; Manager, Community Relations at Rapid Transit at Region of Waterloo. In addition, TriTAG would likely be interested in any concerns you have and through its membership may be able to answer a few questions you may have and relay any concerns. LRT construction in Uptown is now underway! Caroline is now closed from Allen to William and there is a buzz of activity around the site. I'll try to snag some pics later today. 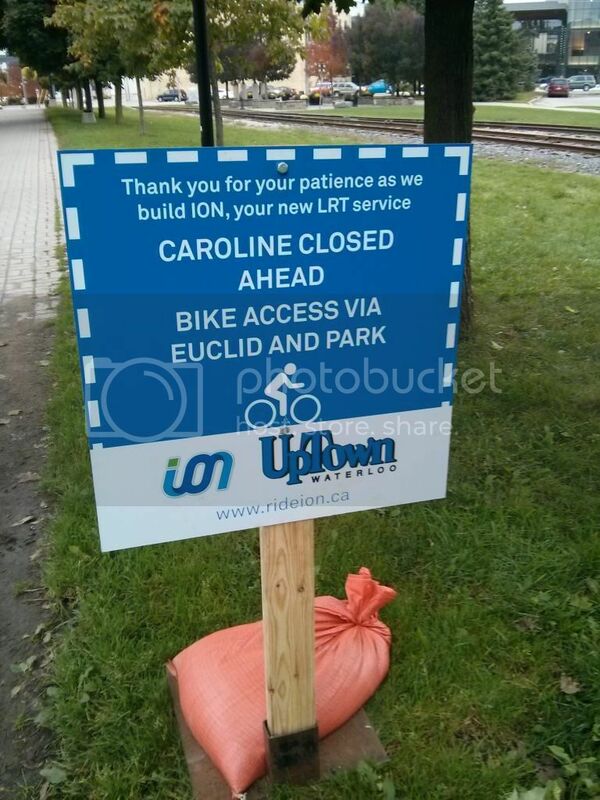 Quote: WATERLOO REGION — Construction for the Ion light rail transit project has created its first road closure. Workers started digging up Caroline Street, between Allen and William streets, at 6 a.m. Tuesday, said Kim Moser, spokesperson for the Ion transit system. "This is the first part of the project that is going to impact pedestrians and traffic," she said. Is it to late to change the rail cars to these cool ones? I'll check if it's to late with Mr. Aissa and Mr. MacDonald. I took these two pictures on Tuesday - sign is from the Laurel Trail and construction is on Caroline at William. So excited to see construction happening!